Automakers remaining in car market will see opportunities as certain brands withdraw models, King says. At the end of 2018, the industry had 3.8 million vehicles sitting on dealer lots, which is the same level as December 2017. That’s 300,000 units in inventory above the level at the end of 2015. SAN FRANCISCO – Advanced safety features are helping drive up transaction prices, used-car sales remain brisk, smaller interest-rate increases should have a modest impact on consumer purchase decisions and dealer inventory levels remain high, according to a market synopsis from a J.D. Power analyst. While a number of industry forecasts for 2019 project U.S. sales will reach about 16.8 million vehicles, J.D. Power is more optimistic, coming in at 17 million units by year-end, says Thomas King, senior vice president of J.D. Power’s Data & Analytics Division. Wards Intelligence forecasts sales right in between at 16.9 million. “There are some meaningful risks and challenges for the industry, but there’s also some good-news stories here that aren’t really getting talked about and I think they deserve to be recognized,” King says in kicking off the J.D. Power Automotive Summit, being held here ahead of this weekend’s National Automobile Dealers Assn. convention and expo. King refers to vehicle incentives, which had been climbing consistently post-recession, reaching an average $4,400 per vehicle in 2017. 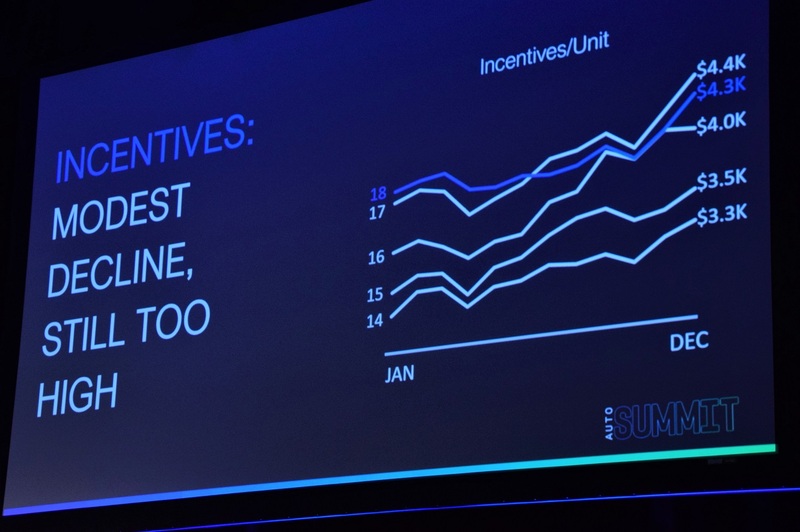 The trajectory throughout 2018 showed incentives heading toward a record $5,000 per vehicle. But about last summer, incentives started falling, finishing the year at an average $4,300 (see chart below, left). King says high incentives mean a large portion of vehicles in the U.S. “were basically being sold at a loss or at best break-even. Obviously that’s not sustainable.” He says incentives started falling last year because manufacturers were doing a better job managing model mix at the plants. King says he hopes to see incentives fall further in 2019. King sees automakers overall unwilling to make production cuts to truly align supply and demand, as demonstrated by high inventory levels across the industry. At the end of 2018, the industry had 3.8 million vehicles sitting on dealer lots, which is the same level as December 2017. That’s 300,000 units in inventory above the level at the end of 2015. “We’ve got a lot of units on the ground,” King says, adding that in 2015 the industry sold an additional 700,000 vehicles. He sees continued contraction in the car market, falling from 44% of retail sales in 2014 to 27% in December as light trucks and utility vehicles continue gaining popularity. The 25% threshold for cars should be crossed by this fall, King notes. FCA U.S. already has ended production of the Dodge Dart and Chrysler 200 sedans, while Ford plans to end sedan output and General Motors plans to ditch multiple models, including Chevy Cruze, Volt and Impala and Buick LaCrosse. GM also is examining production alternatives for the Cadillac CT6, although the automaker has said importing it from its plant in China is not practical. The industry launched 97 all-new, redesigned or refreshed vehicles in the U.S. in 2015, a number that fell to 70 in 2017 and 71 in 2018. But that is forecast to climb to 83 new vehicles or redesigns in 2019, signifying a fuller product pipeline. The average transaction price for a new vehicle has risen from $31,500 in 2014 (net of incentives) to $34,100 last year. Looking more closely at pricing, retail sales for vehicles stickering under $20,000 fell an unprecedented 19% last year, while sales of vehicles priced above $40,000 grew 7.4%. Between 5% and 9% of new vehicles in 2014 were equipped with blindspot detection, collision avoidance or lane-departure warning. In 2018, those penetration rates climbed to between 28% and 33%. From 2017 to 2018, retail sales fell 4.1% in the southwest U.S. and 2.9% in the northwest, while they grew 0.1% in both the southeast and southcentral U.S.
Dealer profits per new vehicle sold have fallen from $1,417 in 2014 to $1,323 in 2018. Finance and insurance have consistently been growing, from $750 per vehicle in 2014 to $906 in 2018. Total profits for U.S. dealers have fallen from $19.9 billion in 2015 to $18.1 billion in 2018. Used cars represent a significant opportunity, as sales at franchised dealers have risen from 10.4 million vehicles in 2014 to 12.2 million in 2018. Much of the growth is driven by supply of off-lease vehicles.